The multistakeholder and dialogue-driven nature of the Forum’s platform leads work undertaken by the World Economic Forum System Initiative on Shaping the Future of Long-Term Investing, Infrastructure and Development not only to examine the strategies investors use to generate nancial returns, but also to consider holistically how investors interact with the society around them. How do investors’ capital allocation decisions shape economic growth and societal outcomes? How do changes in investor practices impact their stakeholders, and the stakeholders of the assets in which they invest? Importantly, the goal is not just to answer these questions, but to use the Forum’s platform to steer global outcomes. Responses to these questions, as part of the International Business Council (IBC) and Community of Chairpersons (CoC) Modern Dilemma discussion series, have transpired from engaging conversations with and valuable guidance from many members of both groups. This White Paper outlines the insights gained from our discussions with four corporate leaders who lead or have led companies that are household names and worth a combined $325 billion: Hiroaki Nakanishi of Hitachi, Indra Nooyi of PepsiCo, David McKay of Royal Bank of Canada (RBC), and Frans van Houten of Royal Philips. These leaders represent diverse industries, geographies and corporate structures, but several common themes emerged from the discussions with them. First, financial markets are not monolithic. Rather than bowing to the pressures of “the market” or quarterly reporting requirements, the leaders revealed the varying reporting expectations of their investor base. They built relationships with their capital providers, and clearly communicated their aims for both the duration and level of investment returns. In doing so, they sought investor input to strengthen their strategies and the resolve to implement them. Second, the investor ecosystem is changing rapidly, which affects how leaders make decisions. The investment value chain is increasingly convoluted, holding periods are shortening, and ownership structures are becoming more dispersed. The leaders interviewed were all too familiar with the complexities of this changing landscape and have developed insights about their investors as well as demonstrated foresight on how automation, quantitative models and other technologies will shape the evolution of the global nancial system. They articulated not only the pressures they face, but the changes their corporations will undergo. Third, leaders do not lead in isolation but through and with the teams they have built. They thrive by building teams and, just as importantly, they definitly navigate the risk, governance and other boundaries surrounding their leadership abilities. Effective leaders understand the role of the board related to governance and risk management, and do not view processes as burdensome constraints but use the structures as a compass that keeps strategy on course in times of disruptive change. Finally, all of these considerations are embedded within complex governance and regulatory systems. The nature of the corporation, the way it is regulated and the relationships between governments, society and business are changing. Regulation, both in the home country and across borders, is complex and difficult for globally operating companies to navigate. 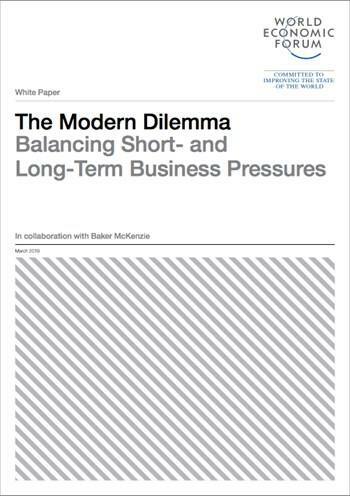 Regulation can be a driver as well as an impediment for boards striving to pursue strategies aimed at balancing the short-term and long-term interests of the companies they serve. Consequently, the subsequent analysis is devoted to these topics, which contextualizes the interviewee perspectives in this paper.